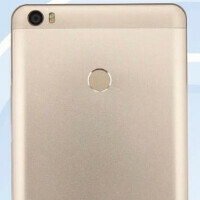 Xiaomi's eagerly awaited phablet has been certified by TENAA, China's equivalent to the FCC. 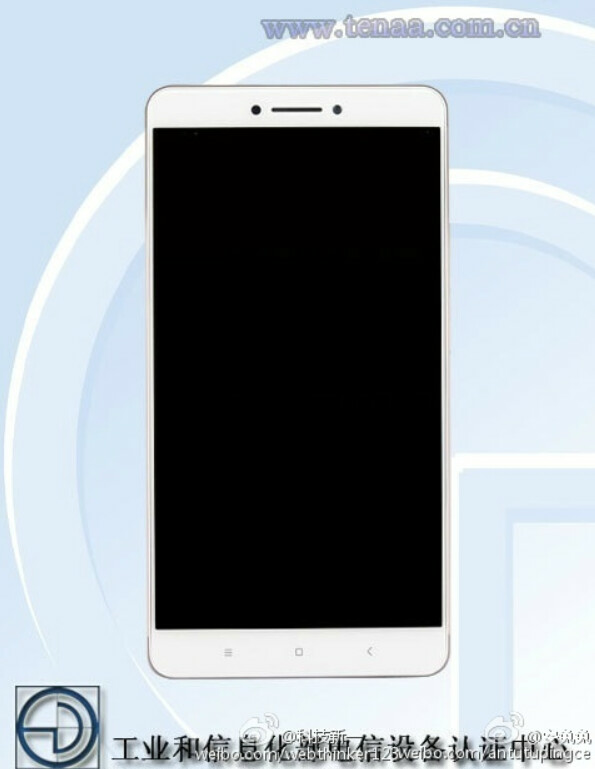 Clad in metal, the Xiaomi Mi Max is equipped with a 6.44-inch display, carrying a 1080 x 1920 resolution. Powering the device is the Snapdragon 650 chipset with a hexa-core 1.4GHz CPU and the Adreno 510 GPU. There are two variations of the device with one carrying 2GB RAM/16GB ROM, and the other equipped with 3GB RAM/32GB of ROM. A 16MP camera will be found on the back of the phone, with a 5MP front-facing camera for shooting selfies and for video chats. There is a fingerprint scanner placed on the back, and a 4000mAh non-removable battery keeps the lights on. Android 6.0.1 is pre-installed along with MIUI 8. Speculation calls for the variant with 2GB of RAM to be priced at the equivalent of $200 USD. 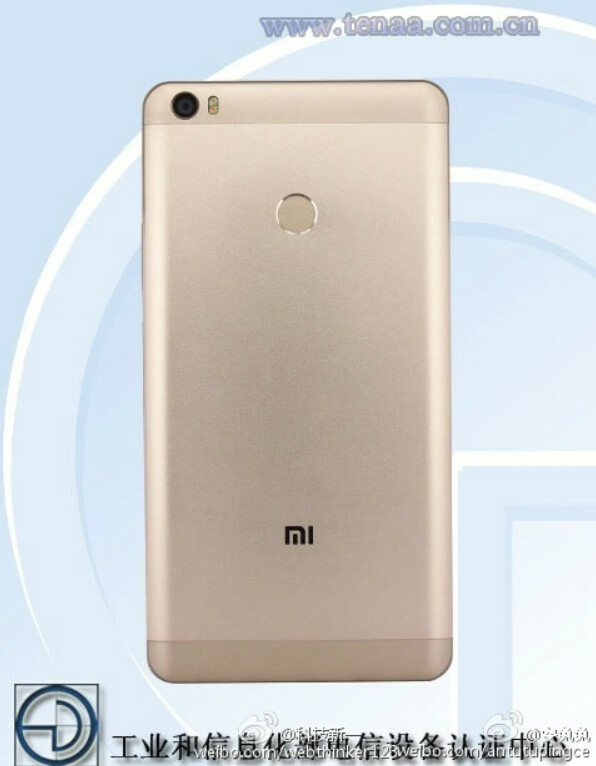 The Xiaomi Mi Max will be unveiled at an Xiaomi event to be held May 10th. At the same time, the company will also unveil its latest user interface, MIUI 8. The Mi Band 2 fitness tracker was supposed to be unveiled at the same time, but just yesterday we learned from Xiaomi CEO Lei Jun that the device will be delayed by one month due to production issues. 6.44"...? Holy... Um... Molly... The way I see it, in 10 years we will have 8" Flagships and 10" Phablets... Our smart watches would be 5", tablets would be in the realm of 30"... And will double as smart TVs... I don't want to see that day, honestly... As a matter of fact, I liked the BACK TO THE FUTURE version of 2015 more than the "original" 2015... Perhaps, I'm too old fashioned and (gulp) backward? The Z Ultra was this size in 2013. I think there is sizable market for 6 inch and bigger smart phones. I used to think 5.7 inch was big enough, but after using Note for a while, it seems 6.5 inch would be better (with very thin bezels of course). Of course, one thing missing is S-pen on Xiaomi phones. S-pen is what makes bigger screen even more valuable, and it would be good if Xiaomi also came out with their own version of S-pen to compliment the big screen realestate. Why is the storage being called ROM? It's not read-only, as it can be written to as well (or else it wouldn't be very good storage if nothing could be saved to it). Unless ROM is somehow being used to describe storage these days. The storage inside the phones are called Flash memories. Flash Memories are a type of EEPROM, which is a ROM. I love the idea. Maybe I will get one in due time.